“LA DAME BLANCHE is an opéra comique in three acts by the French composer François-Adrien Boieldieu. The libretto was written by Eugène Scribe and is based on episodes from no less than five works of the Scottish writer Sir Walter Scott. The opera has typical elements of the Romantic in its Gothic mode, including an exotic Scottish locale, a lost heir, a mysterious castle, a hidden fortune, and a ghost, in this case benevolent. The work was one of the first attempts to introduce the fantastic into opera and is a model for works such as Giacomo Meyerbeer's ROBERT LE DIABLE and Charles Gounod's FAUST. The opera's musical style also heavily influenced later operas like LUCIA DI LAMMERMOOR, I PURITANI and LA JOLIE FILLE DE PERTH. 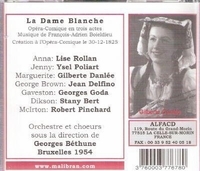 LA DAME BLANCHE was first performed on 10 December 1825 by the Opéra-Comique at the Théâtre Feydeau in Paris. It was a major success and became a standby of the 19th century operatic repertory in France and Germany. By 1862, the Opéra-Comique had given more than 1,000 performances of LA DAME BLANCHE. The opera's popularity began to diminish towards the very end of the 19th century and performances since have been rare. The overture was put together from Boieldieu's themes by his student Adolphe Adam.